Monday afternoon, Guymon and Optima Firefighters responded to a reported grass fire just north of the Seaboard Feed Mill near Optima. The 12:38pm alarm came with difficult winds blowing gusts of 30-40mph out of the south. On first fire units arrival, found that wood chips in a contained area of the mill property had caught on fire and began to burn. “With the wood chips being a light fuel source the wind began to carry the burning chips and embers into a large and dry grass field just to the south of the area”, stated Assistant Fire Chief Grant Wadley. The contained area was made of concrete and 8ft walls but the wind still carried embers out and away from the original fire location. Numerous Seaboard workers at the mill began attempting to put out the flames in the field with fire extinguishers before fire departments arrival. 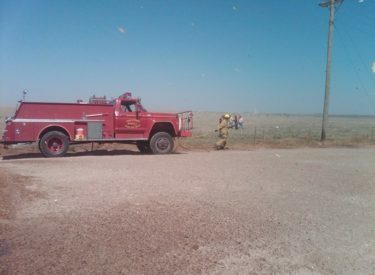 3 fire units from Guymon, 1 from Optima, and tankers from Texas County District #2 had the fires under control by 1:03pm. “Spot fires from the flying wood chips were found greater than 100ft from the original site in the grass simply due to the high winds”, Wadley said. There were no reports of injuries and the cause of the fire was unknown.